When Charles Vanden Haute published a more or less accurate description of the memorial list of the Bruges painters’ trade in 1913, the register had suffered no damage whatsoever. It was not damaged until World War II, just a few weeks before the Liberation in September 1944. In 1942, the City Council had considered it advisable for security’s sake to remove the most precious pieces of the City Archives, the Groeninge Museum, the City Library and the social welfare council and to store them in the uninhabited but well-maintained castle of Lavaux-Sainte-Anne (presently the City of Rochefort in the province of Namur). The documents and works of art were moved during the month of June. There they were held in custody of Herman Bouchery, an Antwerp curator who also was responsible for the moved documents and masterpieces of Antwerp. The transfer to Lavaux-Sainte-Anne was carried out at the urgent request of the German military authorities, though with the approval of the City Council. On 27 January 1944 it was also decided by the City Council at the suggestion of the City archivist to move fifty additional boxes of charters to Lavaux-Sainte-Anne. Most of the records were stored in some two hundred wooden cases in the castle’s cellars. After having been inspected by the assistant archivist Albert Schouteet the documents were removed from the cases on 6 July 1942: some documents had suffered moisture damage. Thereupon, these records were preserved in three halls on the first floor of the castle. It is unknown if the memorial list had already suffered damage at the time. The transport to Lavaux-Sainte-Anne was intended as a precaution against possible war damage, as Bruges was located at less than 30 km away from the coast. However, armed resistance groups were on active service. On 10 and 11 August 1944, a resistance group attacked the castle. For that reason the curator Bouchery decided to evacuate the masterpieces and documents from the castle. The preliminary work for the move already started on 14 August 1944. Various Bruges paintings, especially Flemish Primitives, had already been transported to Brussels in June 1944, where they would be preserved in the Société Générale’s cellars henceforth. 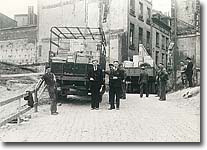 On 16 August 1944, the Bruges City Council decided that the cases and boxes of the City Archives of Bruges, together with the remaining masterpieces and precious works of the City Library, had to be taken to Brussels. A first convoy left on 22 August 1944. Subsequently, the second convoy left on 26 August. This second convoy was inadvertently fired upon by the allied air force in Bouvignes (currently the Cityity of Dinant) shortly after it had left. Five trucks were riddled with bullets. During the firing, two guides were killed, there were five serious casualties and various people were slightly wounded. Several records had obviously suffered damage as well. Ever since, quite some documents of the City Archives have had bullet holes. The memorial list of the Bruges painters’ trade had suffered an awful lot of damage. A bullet had penetrated the register from the back side and got stuck against the inner side of the front board. The wooden boards were shattered and parts are missing. The parchment leaves all have a bullet hole in the text section. Around this hole there were many long irregular star-shaped tears. The Bruges archive records were moved to Brussels after this unfortunate incident. They remained in the cellars of the National Bank until 17 May 1945, more than eight months after the Liberation of Bruges and more than a week after the official war end.